Leading companies from across the globe will be showcasing their most advanced solar technologies, at the third Dubai Solar Show which opens on Tuesday (October 23) in the UAE emirate. It is being held in conjunction with the 20th edition of leading utilities expo Water, Energy, Technology, and Environment Exhibition (Wetex 2018), said the organisers Dubai Electricity and Water Authority (Dewa). The third Dubai Solar Show will cover approximately 14,000 sq m, attracting 125 exhibitors and more than 10 sponsors from around the world. It is being held under the umbrellas of the fifth session of Green Week and the fifth session of the World Green Economy Summit (WGES). The event is the region's largest solar energy exhibition, serving as an important platform for both government and private sectors to contract and build partnerships, review latest technologies in the solar sector and regional current and future projects, as well as identify market needs, and participate in solar energy projects and programmes, it stated. Organising Wetex, Dubai Solar Show and WGES at the same time provides an opportunity for thousands of local, regional, and global exhibitors, participants, officials, and decision-makers, to benefit from the agenda of conferences, workshops and specialised events. They will also meet experts and specialists from around the world to discuss the development and expansion of solar energy usage in the region to achieve sustainable development and ensure a sustainable future. This is in line with Dewa’s vision to be a sustainable innovative world-class utility it stated. "Organising the third Dubai Solar Show after the success of the second highlights the UAE's leadership in this field and its leading position in increasing the reliance on solar energy, transforming to a green economy that embraces sustainability in the regional environment, society, and economy," remarked Saeed Mohammed Al Tayer, the managing director and chief executive of Dewa and founder and chairman of Wetex. "The UAE leads the region in shaping the future initiative, in line with the vision of its wise leadership. That is why we have invested heavily in solar energy, and set ambitious goals reinforced by innovative initiatives that contribute to these goals," he noted. 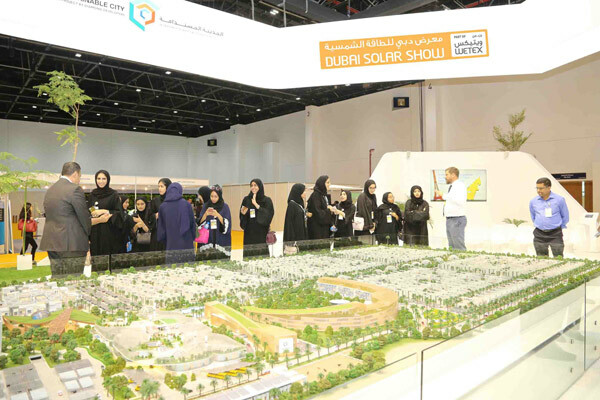 "The third edition of the region's largest solar energy exhibition coincides with national efforts to achieve the objectives of the UAE Centennial 2071 and the UAE Vision 2021 to create a sustainable environment in terms of air quality, conservation of water resources, more reliance on clean energy, and implementation of green development in Dubai," said Al Tayer. The exhibition also achieves the objectives of the Dubai Plan 2021 to establish Dubai as a smart and sustainable city whose environmental elements are clean, healthy and sustainable, he added. Al Tayer said the Dubai Solar Show had special significance, as it provided a comprehensive view of the future of renewables and solar power, with the use of new technologies and innovations that would drive growth and development in this field. “The show will highlight Dubai's key clean energy initiatives, which are key to implementing the Dubai Clean Energy Strategy 2050. The Shams Dubai initiative, launched by Dewa in support of the Dubai Smart Initiative to make Dubai the world's smartest and happiest city, will be one of the most important initiatives to be showcased during the show’s three days, and to be promoted to all stakeholders. The initiative aims to encourage building owners to install photovoltaic (PV) panels on rooftops to generate electricity and connect them to Dewa’s grid,” he stated.